Brighton, MA, nice location right outside of Boston, where many Everlast Composite siding projects have been completed and this home is no exception to the list of beautiful homes done in Everlast. Many homeowners in Brighton wonder - what is the best siding for my home and how much will the siding cost? Well, Everlast Siding is less than a good amount of other siding options, while offering the best qualities of all of them together. 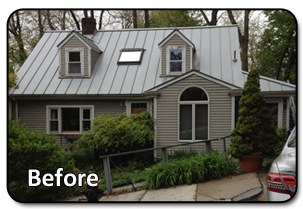 Which is why these local homeowners decided to with the most rational and logical choice in Everlast Composite Siding. The homeowner was considering different types of siding, like wood, cedar, fiber cement and vinyl siding, but none of them were as appealing to him as the Everlast Composite siding was. 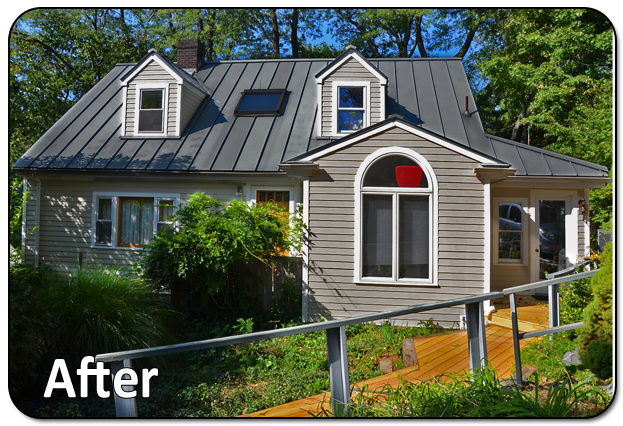 He first was going with the Seaside Gray Everlast, but decided that Sand Dune would look better with the home's dark green metal roof. I bet the NFL replacement referees wouldn't have been able to make the right choice, but I would have to side with the homeowner on that play, great choice! Blown in insulation was added to warm the home, due to improper installation of insulation by the previous homeowner. You can be rest assured the Everlast team made sure every portion of the siding was insulated correctly the 1st time around. The home previously had wood siding and vinyl siding on different parts of the house so we had to remove and perform a complete demolition of the old siding because of mold and mildew issues. Stainless-steel, ringshanked nails were used to fasten the 4.5-inch Sand Dune, Everlast siding. We used a 4-inch SuperCorner for the corner boards of the home and replaced all the window and door frames with a white cellular PVC frame, alone with the rakeboards and eaves of the roofline.